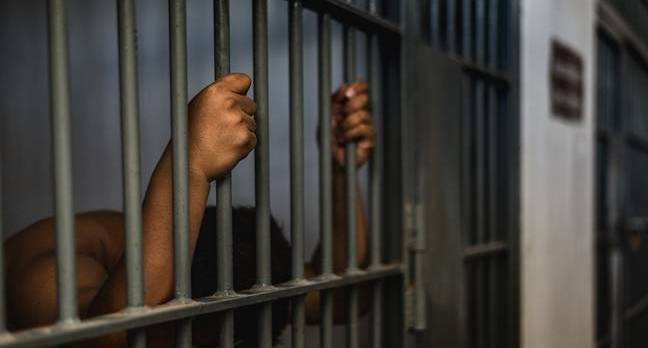 Home / News / Nigerian Man Jails His Parents For Embezzling Money Sent To Them To Build Him A House While He Was Hustling In Italy. 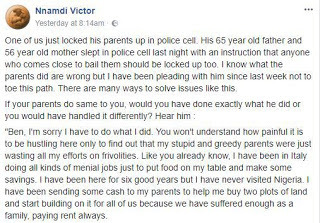 Nigerian Man Jails His Parents For Embezzling Money Sent To Them To Build Him A House While He Was Hustling In Italy. A Nigerian Man based in Italy got the shocker of his life after he came back from Italy to discover that his Parents whom he has been sending money from all his hustling to build him a house in Nigeria have been sending him pictures of a fake house instead. The Italy based Nigerian man has reportedly gotten his 65 year old father and 56 year old mum arrested for allegedly sending him pictures of a fake house they claimed they were building for him while in Italy. 'One of us just locked his parents up in police cell. His 65 year old father and 56 year old mother slept in police cell last night with an instruction that anyone who comes close to bail them should be locked up too. I know what the parents did are wrong but I have been pleading with him since last week not to toe this path. There are many ways to solve issues like this. If your parents do same to you, would you have done exactly what he did or you would have handled it differently"? "Ben, I'm sorry I have to do what I did. You won't understand how painful it is to be hustling here only to find out that my stupid and greedy parents were just wasting all my efforts on frivolities. Like you already know, I have been in Italy doing all kinds of menial jobs just to put food on my table and make some savings. I have been here for six good years but I have never visited Nigeria. I have been sending some cash to my parents to help me buy two plots of land and start building on it for all of us because we have suffered enough as a family, paying rent always. Ben do you know that my foolish parents only bought one plot of land and nothing has been going on there apart from the initial foundation.? In fact they started the foundation recently when they knew I will be visiting Nigeria. They have been sending me fake pictures of my house. Bro I'm mad. I don't know what they used all the money for. They don't know how I managed to make these savings. Omg I just wasted six years in Italy without anything to show for it. If I can't trust my own parents, who then can I trust? I will spend the remaining money I have with me on police to make sure they remain there until I go back to start a new hustle. Please Ben if you have a trusted lady in her late thirties who can build with me, kindly hook me up to her. I can't trust these foolish parents of mine again." So sad! Guys what's your opinion regarding his action, do you think he went too far or not?